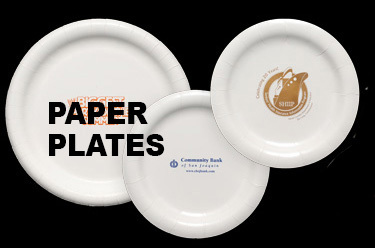 We have paper and plastic plates. SHIPPING IS FREE ON ALL PLATES. NO SET UP CHARGES EITHER. 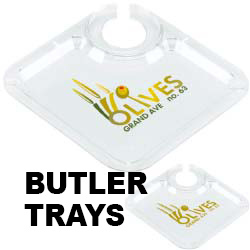 One is the clear reusable acrylic canapé party tray (AXCT). 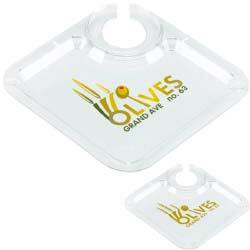 It has a slotted corner holder to accept stemware up to 1/2 inch in diameter, or cups with bases to 2 1/2 inches. 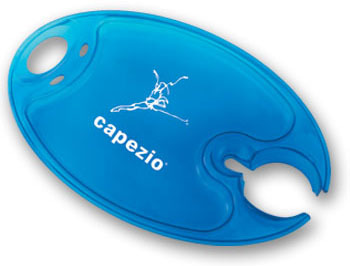 We also have the colorful party plate which holds cans as well as stemwear. There are also slots for forks and spoons and a thumb hole. 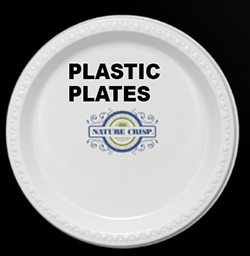 NOTE: Plastic Plates sometimes have scratch or rub marks from the molding and manufacturing process. These are not considered a defect. 1000 quantity and change it to your quantity in the shopping cart. 150 is the absolute minimum.